Lots of people complaining here and all agree that it should NOT only be GP to determine the initial grouping, as some very unfair match-ups can result for various reasons. You are assuming, that GP is the only parameter used for determining matchups. I believe you're wrong. Also, please define what you mean by 'unfair match-ups'. In my oppinion even match-ups are unfair, because players with strong rosters (even GP) would not have any advantage over players with weak rosters. Fair and even are two different things IMO. Players build a certain way. They shouldn’t be penalized because they built strong toons and didn’t bother with fluff “gotta catch them all “ toons. That’s how a free to play player builds to have any shot to keep up with meta. They don’t mod toons they don’t use. They don’t gear toons they don’t use. They invest resources in toons that will help them stay competitive. There shouldn’t be an issue with that. If you keep getting curb stomped by then because they built better, than build a different way or just join GA for the free resources you’ll collect. You would be 100% incorrect. Raw GP is all that is used , which is why we are having this discussion. Ah the irony of telling others to "Git gud" while trying desparately to defend your competitive advantage. Ah, the welfare , please give me all hand outs you can, type of player. Get over yourself and what you think you deserve. Get your free stuff, and get to putting in work on toons that are strong, and not fluff toons. This is build, or be killed. Play as you like but don’t blame someone for building to be strong. False. No desperation was used. On a real note though. I don’t get why people hate on those that build to be strong. What’s wrong with doing that? As far as your repeated "when weak characters blah blah blah" ive already answered the why. More than once. Not liking the answer does not discredit it. Again not sure why the name calling, but same goes back to you, its just a game. I know you all love your easy matches and free rewards, thats fine. But don't act like you did something special , we have the same toons powered up i bet , i just have more of them than you, and that's ok, but dont delude yourself that you did anything special or have any kind of skill lol. You just have a leaner roster, id say against the spirit of the game, but if cg dont care , i dont either. My biggest problem is that based on what I see in my opponents, overall GP is ***very*** similar, but toon GP is not. If you have a toon-only GA, then only toon-GP should count, not ship GP. If you have a toon + ships GA, then okay. Now you count both toons and ships. But until you start matching people based on overall GP and then put them in a ship-only GA, the toon-only matches that includes your ships in the "matching" calculation are poorly thought out and should be changed. Never said I did something special. Against the spirit of the game? Haha yeah, ok. I chose , as many others did, to build a specific way. Others chose different. No one went against some fictional moral code the game has for building certain toons. Y’all are frustrated because it’s a mode that won’t just give the same rewards for any style of play. Doesn’t mean anyone deserves any hate. And no we didn’t do anything difficult, we just did something DIFFERENT. Never did I say we deserve a gold star or a dundie for building differently. That’s an insinuation on your part. I’m just saying, don’t be haters. Play the game the way you want. Build the way you want. Stop trying to make it seem like some sort of crime for others to build different than you. Because it isn’t at all. I believe that’s the spirit of Pokémon Go. I’m done. Good luck to you. And may the force be with you! Could you please refer me to a source for this claim? 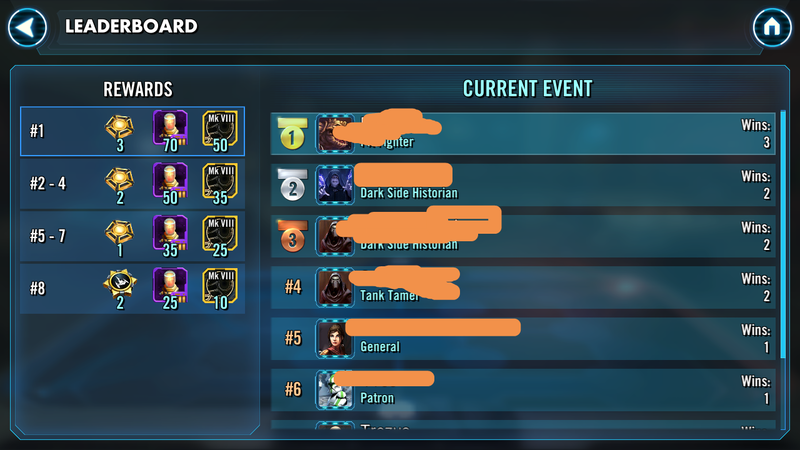 G10 jawas cant even beat G8 phoenix. That's a great strategy at your level, I can only speak from my current GP bracket but at 4+mil ships defense isn't really a thing. At most you'll get one defensive stop and that's it, which is the same as hoping for a defensive stop on regular characters. But with Thrawn everyone just uses them on offense to blow away the hardest ships, and if they lose, their Tarkin will easily clean up the mess next time. I do the same strategy of leaving weaker defenses and save for offense, but usually it ends up where they have a lot for both offense and defense (cause after 4mil, defensive spots don't increase) and their offense will gain more points using 1 or 2 characters on offense against my weaker squads, where I cannot use that strategy. My strategy is put in B and C grade teams in front 2 zones and hope they underestimate the battle and lose, or use up a strong team needed for my A grade teams in the back. That's a great strategy at your level, I can only speak from my current GP bracket but at 4+mil ships defense isn't really a thing. Yes, I'm aware, that the requirement for it to work is, that your defensive fleet must hold on defense (as already stated) which is rare at high GP levels. It could happen, if your opponent doesn't have a counter to your strong Mace timeout fleet or your strong HMF/Ackbar fleet - but yes, it's rare at that stage in the game. The match making is very unbalanced...that's why they are fighting so hard to keep it...some don't care about what's fair only that they continue to get premium rewards with out any risk on thier part. It is more then apparent that that the whole GA is a pyramid scheme.. designed to benefit those on top..forcing the ones on bottom to invest more to no avail..by the time you catch up they ( those on top who have no challenge and breeze through it) will be light years ahead of you with all the Zata and gear awards unearned other then a push of a button with all thier 44 Zata toons against your 30 or so and tons of "fluff". I for one have placed real world cash on this game almost weekly for years. And GA has left me very bitter and feeling cheated and even ripped off. Even if those on top stopped playing for a few months I could not catch up to 44 Zata toons at g12. Yet those are my matches. So in closing too all those on top easily stomping through, .......Get GUD!!!!... So CG can stop handing you wins at the expenses of fluff rosters to make yourself feel accomplished. Weak characters didn't "help" you win. You won because you have the dominant fleet. If they beat your fleet, they would have easily beaten you. I have ****/HT and use this strategy too. However, I dont lie to myself and claim that my fluff saved the day. I'm just confused as this game mode seems to punish you for opening up more toons. I assumed they'd want you investing in a broader roster to try them all out, but GA tells you to just focus on a core group and leave everything else as low as possible. Interesting decision. FWIW I'm in a smaller guild, and we can't get into TW sadly (just once - loved it! ), so this is my only chance for these type of matches. I've done quite well in GA, but I've had a lot of wins due to poor opponent strategy or them not setting defense or bothering to attack at all, and a couple where I had a 80k character GP advantage. None of those were much fun sadly. Also had some huge losses against opponents with 80-100k bigger character GP, and one match my 6x G12 toons vs their 31 lol. They were even less fun. But the few matches where we ended up within 20 points of each other was great fun (win or lose)! 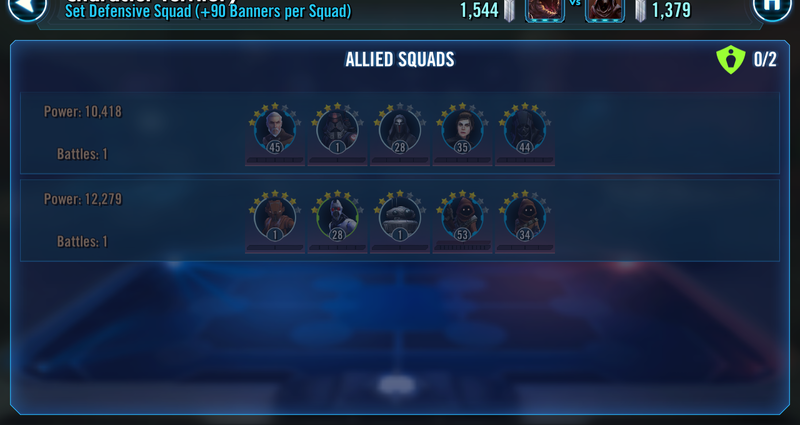 It is just a game, so I won't lose sleep, but it does feel wrong that I'm hesitating to level up half a dozen characters to 7* because I can't get them to G10+ straight away, so will hurt me in GA. I'd love some TW for smaller guilds needing only 12-18 signed up.